The output power is stated in type of milliwatt (mW). Lasers are divided into different safety classes on basis of output power. 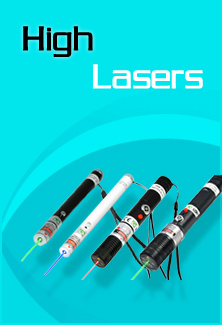 ● Class 3A/IIIa 1mW-5mW laser pointers are used in education and business pointing, lecture, speech and pet toys. ● Class 3B/IIIb 5mW-500mW high power lasers are widely used in thermal and burning experiments in scientific research, military targeting, medical care and astronomy etc. ● Class 4/IV ＞500mW Extremely high power lasers are only applied by professional in scientific research, military, industry and equipped with safety measures.